Toyota Tacoma 2005 - 2008 TRD Seat Covers - OEM NEW! 4.5 out of 5 stars - 2005 2006 2007 2008 TOYOTA TACOMA SEAT COVERS TRD SEAT COVERS FACTORY OEM NEW! 29 product ratings29 product ratings - 2005 2006 2007 2008 TOYOTA TACOMA SEAT COVERS TRD SEAT COVERS FACTORY OEM NEW! Seat covers for Toyota Rav4 2019 Full Set (Includes Front Seats, Rear Seats, armrest, headrest, and console). Perfect custom fit and nice detailing covers for your Rav4 and also easy to install. The material is fabric and they are long-lasting covers. Seat covers for Toyota Tacoma TRD 2005-2019 Full Set (Includes Front Seats, Back Seats, arm and headrest, and console). 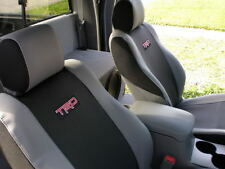 Perfect custom fit and nice detailing covers for your Tacoma TRD and also easy to install. Seat covers for Toyota Corolla HATCHBACK 2019 Full Set (Includes Front Seats, Rear Seats, armrest, headrest, and console). Perfect custom fit and nice detailing covers for your Corolla and also easy to install. In case of Corolla 2019, this ONLY fits the 2019 SEDAN model. NOT THE HATCHBACK CONCEPT. Seat covers for Toyota Corolla 2014-2018 Full Set (Includes Front Seats, Back Seats, arm and headrest, and console). (The Rav4 2019 concept photo is labeled.). THIS COVER FITS ALL TOYOTA RAV4 2019 (except hybrid). Seat covers for Toyota Rav4 2006-2018 Full Set (Includes Front Seats, Rear Seats, armrest, headrest, and console). New Black color Semi Custom Fit Car Seat Covers Set Support 40/60, 50/50 Split Rear Seat and Center Console, Smart Pockets Side, Air Bag Compatible Extra Thick Padding. New design car seat covers set made with durable black color polyester fabric provides perfect protections for your car seats. New 8 Pieces Flat Cloth Sleek Design Black and Tan Front and Rear Car Seat Covers Set with Vinyl Trim Carpet Floor Mats. Note: This is a semi-custom size set which can generally fit all cars with regular size seat. Fits vehicle with electric Sport Bucket seats. Will not fit SR5 BASE with manual seats. ALSO FITS 2014-16 MODELS WITH POWER DRIVER AND MANUAL PASSENGER. Fits Cloth/ Leather : Fits Factory Leather - Fits Factory Cloth. You need to remove your existing upholstery before install it. There are differences between Japan and USA made. 2014-2019 TOYOTA TUNDRA CREWMAX FRONT BUCKET SEATS FACTORY OEM CLOTH UPHOLSTERY IN BLACK/GREY. YOU NEED TO REMOVE YOUR EXISTING UPHOLSTERY BEFORE YOU CAN INSTALL IT. 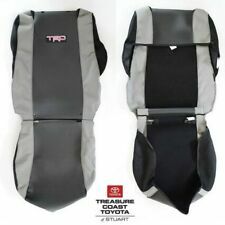 2014-2019 Toyota Tundra Crewmax SR5 / TRD PRO OEM Factory cloth seat covers. BRAND NEW TAKE OUT These are not slip on covers!!! UP FOR SALE IS ONE SET OF FACTORY CLOTH SEAT COVERS for 2014-2019 Toyota Tundra Crewmax SR5 / TRD PRO. THESE COVERS WERE TAKEN OFF OF A BRAND NEW 2019 TOYOTA TUNDRA CREWMAX BY A PROFESSIONAL UPHOLSTERY SHOP. Black color. Headrest covers are not included. Make sure that the pattern is right before you buy the kit. This kit needs to be installed professionally at the local upholstery shop. Attention: Installation instructions are not included! Needs to be installed by professionals! A set of two seat covers in graphite for the front two bucket seats and head rests, the seat cover has the Tacoma logo - is a "wet suit type" material with a design enhanced woven material and ribbed styling. 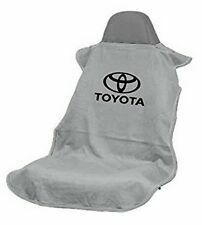 2014-2018 Toyota Tundra OEM Gray cloth seat cover set. 2014-2018 Toyota Tundra front seat cover set. New Toyota factory part removed froma new Tundra for leather. Toyota calls color Gray (only 1 gray 1 tan and 1 black). For : Toyota 4runner. All leather seating surfaces on 1/2" high resistant quilting foam to give your seat a full and new look. All my leather seat covers are exact fit, and exact color match! This isn't just any leather this is very high end leather made for automotive use. READ ENTIRE AD TO ENSURE CORRECT FIT, COLOR AND PATTERN. THESE ARE NOT SLIP ON COVERS. FRONT SEATS and SECOND Row Captain chairs (not for split bench in second row). Photos above look grey but it is beige. 1984-1988 Toyota Truck Front Bucket Seats Factory Seat Covers -Brown Vinyl. Toyota vinyl style number: FV-783. These are not slip on covers. Existing factory seat covers will need to be removed to install these. 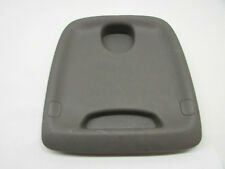 1984-1988 Toyota Truck Bench Seat Factory Seat Covers - Gray (toyota body cloth number FV-656). Includes bench seat cover and seat back cover with built in headrests. These are not slip on covers. Existing factory seat covers will need to be removed to install these. These are not slip-on seat covers, but rather they are designed to replace the existing factory cloth or leather seat covers in your car. Each leather upholstery kit is manufactured from automotive grade, top grain leather and includes: seat covers for all rows of seating in your vehicle, headrest covers, armrest covers. You are viewing a set of used OEM cloth seat covers for a 2016-2019 Toyota Tacoma Double Cab SR5, SR, TRD. These covers are in very good condition, but may need light cleaning to freshen them up(we enclose washing instructions with every set) or vacuuming to remove lint or dust after you install them due to handling. 4 black color floor mats with driver side heel pad.Front mat size 17" X27" rear mat size 17" X13". New Black color Semi Custom Fit Car Seat Covers Floor Mats Set Support 40/60, 50/50 Split Rear Seat and Center Console, Smart Pockets Side, Air Bag Compatible Extra Thick Padding. Remove d from a new Highlander. This is a set of factory Toyota cloth seat covers. replace worn cloth seat covers, not to go over the top of covers. Front and rear seat set (no headrest covers). Tan(sand beige) in color. For sale is (1) Factory Original leather/cloth seat cover for a 2012 Toyota Camry. It is black/gray in color and is in excellent condition. It is for the rear upper 60% seat back. This seat cover may fit other years/models. 2007 Prius Hybrid OEM Seat Covers in the color Shale. These cloth covers were taken out of a 2007 Prius Hybrib with less than 40 miles. -40/60 Split Bench Seat Back covers (2pieces ). -Passenger Seat bottom. I never took them out of the plastic covers. I am not sure what all years these covers will fit but …. Precision Fit Seat Covers. Seat Side Airbags Front. Seat Side Air Bags, Front. These are not related to "pull over" protective seat covers. Can be installed DIY with hog rings and hog ring pliers (check YouTube for ref.). Original Toyota upholstery pieces. Do not be forced to buy a used - dirty seat - from a junk yard. Missing headrests (THIS IS NOT SEAT COVER). You need to remove your existing upholstery before install it. 2015-17 Toyota Corolla Le Leather Covers !! Brand New ! 2015-17 Toyota Corolla Le leather full set covers front and rear with rear and center armrest/ door panels/headrest. 2015-2017 toyota camry. Condition is Used.light gray in color came out of a used 2017 with12k cleaned amd sanitized NON SMOKER car. Toyota RAV4 Oem Fabric Piece / Repair Fabric Gray 48 3/4 in. x 19 in. Toyota RAV4 Fabric Piece in Gray Picture of Fabric Sample included Roll of fabric measures 48 3/4 in. x 19 in. Feel free to email with any questions Thank you for your interest! TOYOTA PRIUS C HATCHBACK. THIS IS A CLOTH UPHOLSTERY SET REMOVED FROM A NEW VEHICLE TO BEING UPGRADED TO LEATHER INTERIOR. THESE ARE FACTORY ORIGINAL CLOTH UPHOLSTERY COVERS. To install this interior the seats must be removed from the vehicle and the old material must be removed. 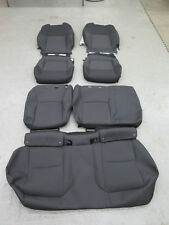 For sale is (1) Factory Original leather rear seat cover set for a 2012 Toyota Venza. It is gray in color and is in excellent/new condition. These seat cover may fit other years/models. Just to be clear, you will have to remove your existing seat covers down to the foam to put these on. 2003 - 2008 Toyota 4Runner 2nd Row 40 Back LH OEM Seat Cover - New - Black Cloth. These are not related to "pull over" protective seat covers. Can be installed DIY with hog rings and hog ring pliers (check YouTube for ref. ).